So one question from yesterday’s Legacy Family Tree webinar, The Ties That Bond, keeps coming up. Where, oh where, can I find those bonds? Marriage bonds, bastardy bonds, official bonds, appearance and bail bonds — they’re all among the very best genealogical records we might find and so very underused as resources. They’re great because they give us clues to our ancestors we might not find in any other way. And what did that one document reveal? Only a few things of interest. Like the maiden name of the intended bride, Elizabeth Brewer, a fact stated in no other document we have ever been able to find. 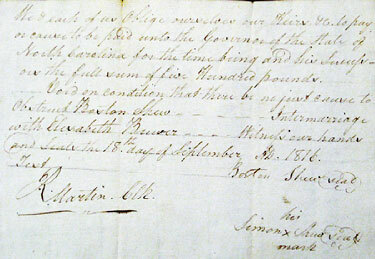 And mining the document for more subtle clues, we might realize that the groom, Boston Shew, could sign his name. That his bondsman, Simon Shew, could not sign his name. And we’d have good reason to believe — since the bondsman was taking the risk of having to pay a huge sum of money if the bond was ever forfeited — that the bondsman must be very close kin indeed to be willing to put himself on the hook like that. So… did our ancestors ever have to file a bond and, if so, where might it be found today? 1. Did my ancestor ever have to file a bond? It depends, first, on what the law at that time and in that place required a bond for. I know I sound like a broken record here, but there’s really no substitute for cozying up to the statute books for the places our folks came from. It doesn’t make any sense to be out there hunting for marriage bonds for a place that didn’t require them at the time. • Did an ancestor get into trouble with the law? Look for a bail bond or an appearance bond. • Ever get herself with child out of wedlock? Look for a bastardy bond. • Ever sue or get sued in a civil case? Look for a bond related to the court proceedings. • Ever lose a case and want to appeal? Look for an appeal bond. • Ever become a public official of any kind? Look for an official bond. • Ever serve as administrator or executor of an estate or guardian for children? Look for a bond of that type. Once we figure out all the possible types of bonds our ancestors might have had to file, we go on to the next question. 2. Where would the records be today? • Identify the jurisdiction — the town, city, county — where the event took place. • Figure out what the modern jurisdiction is (since county lines changed and towns came and went). • Find out whether the kinds of records we want from that time frame in that jurisdiction survive. • Find out who’s got those surviving records now. And, of course, one place to look, always, is the catalog of the Family History Library. If I can find what I’m looking for on microfilm and can have it delivered to my local Family History Center, I’ve saved myself a road trip. So I often check there first. Notice that this doesn’t include any of the bonds that might have been filed with the courts because of court cases except probate cases. So I need to look further for those. The court minutes or dockets, perhaps. The loose case files. Or, very likely, a set of records that’s never been microfilmed and is still sitting in the courthouse in Accomac or Virginia’s fabulous archives and library, the Library of Virginia in Richmond. To find everything, I’m likely going to have to look at local records, county records, microfilm and records that have been moved to the State Archives. For me, with my fourth great grandmother’s maiden name tucked neatly into my heart on one single piece of paper now at the North Carolina State Archives, all I can say is, you betcha it is. Hmmm. I get an error message when I click on your link to the old Family Search catalog. I don’t know why that would happen, Ginny. It works for me in both Chrome and Firefox browsers. Thanks Judy – I’m on the old family Search and digging through all those bonds records. I was surprised to find some UK ones too – so I’ve added them to my to-do lists. Mining for a little gleam in these lists… There’s gold in them thar bonds! Cheers. You’ll find bonds in Canada and other common law countries as well, Celia. Have fun playing with these records!